Discussion in 'Updates' started by JRW-910, Sep 24, 2013. Well, ASUS already spilled the beans on this one. Just a few hours ago, the company posted a YouTube video of its new Zenbook UX301 Ultrabook -- i.e., the sameZenbook Infinity we saw back at Computex, just with a new (less catchy) name. Well, if a teaser video didn't make it official enough for you, the company just revealed the laptop on-stage here at its IFA press event in Berlin. As we learned back at Computex, this has a lid made of Gorilla Glass 3, which promises to stand up to both scratches and maybe even drops. Meanwhile, the palm rest is also made of glass, though there's a ceramic coating mixed in, so it doesn't feel at all glassy; just exceptionally smooth. (Think of how smooth the metal on Samsung's old Series 9felt and maybe you'll get the idea.) All told, this definitely isn't the thinnest or lightest Ultrabook we've held, at 1.38kg (3.04 pounds), but on the plus side, you get a good deal of travel on that backlit keyboard, and most of the keys are amply sized too. Also revealed in that spoiler of a YouTube video: the UX301 comes standard with a 13.3-inch, 2,560 x 1,440 IPS touchscreen. On the inside, it combines a Haswell dual-core Core i7-4558U processor with 802.11ac WiFi, up to 512GB of solid-state storage and Intel Iris graphics -- basically, the best Intel has to offer short of a discrete GPU. If you do need more power, though, ASUS will also offer an NVIDIA GT 730M GPU on some models. Additionally, ASUS will sell a lower-end spinoff called the UX3012 (not pictured here), which will have generally the same design, but a lower-res 1080p screen. 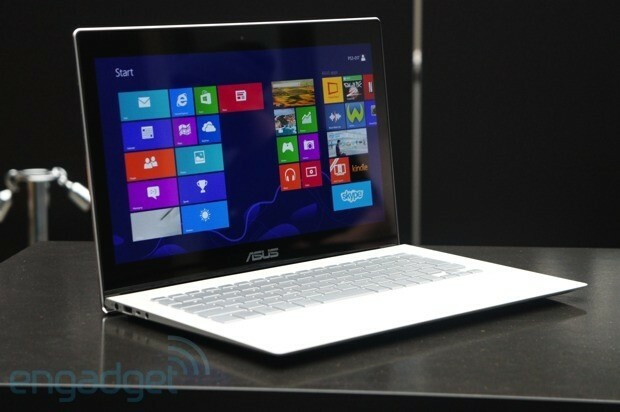 Both will be available in white, along with a dark, navy blue -- quite the departure from ASUS' usual color scheme. No word yet on pricing or availability, except that the line is still on track to ship sometime in the fourth quarter. For now, we've finally had a chance to get some hands-on time -- remember at Computex when we had to snap photos through a glass box?